In a world full of SUVs and crossovers all competing for similar buyers in similar segments, there are still some models that find their own little niches that lack such fevered fighting. The Jeep Grand Cherokee is one of those vehicles. It’s an oddball in the sense that it’s a midsize crossover SUV with a unibody chassis and independent suspension, but it still uses rear-wheel-drive and four-wheel-drive systems and has some off-road capability. It’s also a midsize crossover, but only offers two rows of seats. 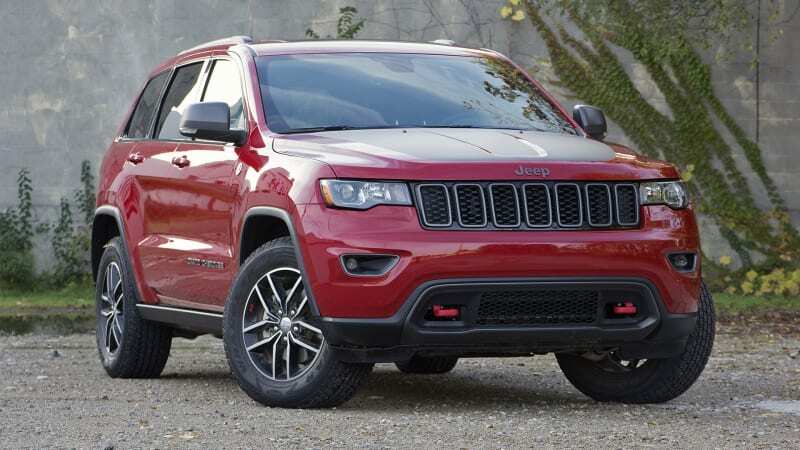 Despite the Grand Cherokee’s odd nature, we did come up with a few crossovers and a classic SUV that seem to match the Jeep in size and pricing. We looked at the numbers to compare them on paper. You can find the raw data in the chart below and deeper analysis after that. As always, this is just a comparison of specifications and you’ll want to check out our driving impressions of each car if you’re getting serious about one or all of these vehicles. And if you want to compare any of these against other vehicles, be sure to check out our comparison tool. When comparing base engines, the Jeep Grand Cherokee’s 295-horsepower is the clear power winner, beating the next most powerful 4Runner by 25. But in torque, the 4Runner takes the laurels with 278 pound-feet, narrowly edging out the Edge’s (no pun intended) turbocharged 2.0-liter four-cylinder’s 275. That four-cylinder in the Edge will also be picking up another 5 horsepower for 2019, but it still won’t win this power contest. Both Ford and Jeep also have another advantage in the fact that you don’t have to settle for the base powertrain. Ford has two other engine options, a naturally aspirated V6 and a twin-turbocharged V6, the latter of which outguns the Grand Cherokee’s gasoline V6 in both power and torque. That engine will also be bumped up to an impressive 335 horsepower and 385 pound-feet of torque. The Jeep has the most engine options, though, and it’s the only to offer V8 and diesel options. On most Grand Cherokees, the options include a 5.7-liter V8, which is only available with 4WD. It makes 360 horsepower and 390 pound-feet of torque, outperforming even the 2019 Edge’s twin-turbo V6. The diesel engine doesn’t make much power with just 240, but it makes up for it with torque at 420 pound-feet. And of course there are the SRT and SRT Trackhawk models with even bigger and supercharged V8 engines respectively. They’ll smash any of these other crossovers, but you’ll also pay for that family hauler-demolishing performance. Also worth noting is that the Jeep and Nissan have the most ratios to pick from since they use 8-speed and CVT transmissions respectively. The Ford has a fairly conventional 6-speed auto while the Toyota has a positively ancient 5-speed automatic. All four of these crossover SUVs are similarly sized. The 4Runner and Murano are the longest by a small margin, and the Grand Cherokee and 4Runner are the tallest by a similarly small margin. Though the Ford and Jeep are the widest, we should note that their listed widths include the mirrors. Neither the Toyota nor the Nissan specified whether the width excluded mirrors, but the discrepancy leads us to believe the mirrors weren’t included. Basically, all of these are very close in size. That is except for when weight and ground clearance is considered. The Edge and Murano are the lightweights of this group weighing in around 4,000 pounds. The Grand Cherokee and 4Runner are pretty massive with each starting around 4,500 pounds. The 4Runner tops out around 4,800 pounds, but the Grand Cherokee can balloon to nearly 5,500 pounds. The 4Runner also has the best standard ground clearance, but the Grand Cherokee with air suspension can snag an extra inch over the Toyota as needed. Moving to the cabin, the Edge is overall the most spacious. It’s dominant in all passenger space and is second in cargo space. The 4Runner has the most cargo space by quite a bit, but passenger space is very tight especially for rear passengers. The Toyota does also have an available rear seat that can be handy in a pinch, but isn’t someplace anyone would want to be for a long time. With towing, the Jeep Grand Cherokee is the runaway winner. The least capable model, the gasoline V6 manages 6,200 pounds of towing, which is 1,200 pounds more than the next best Toyota 4Runner. The best towing Grand Cherokee is the two-wheel-drive EcoDiesel with 7,400 pounds of towing. The Grand Cherokee, Edge and Murano are all very close in price. The Edge’s base price of just over $ 30,000 wins out by a bit over $ 1,000, and the Jeep and Nissan are within a couple hundred dollars of each other. The 4Runner is the expensive SUV of the bunch at over $ 35,000. Of course the Jeep Grand Cherokee SRT and Trackhawk get extremely expensive, but those vehicles are more comparable to high-performance SUVs from Europe that come with comparably high price tags. With fuel economy, the Ford Edge has the best available fuel economy with its front-wheel-drive four-cylinder model. For all-wheel-drive, the Nissan Murano is the best bet. In fact, it only makes sense to get a Murano with all-wheel-drive because there’s no difference in fuel economy. Front-wheel-drive only saves a bit of money initially. The 4Runner has the absolute worst fuel economy, delivering numbers on par with the V8-powered Jeep Grand Cherokee. The 4Runner likely suffers from only have a 5-speed transmission, quite a bit of weight and a less than aerodynamic body.